I made a Thin Mint Cake for Midsummer's, and when I evened out the cake layers, I was smart enough to put the scraps in a bag in the freezer. For Fourth of July, I defrosted those scraps, and crumbled them. I added a little bit of milk and cream cheese, and mixed until I had a nice dough. I rolled balls, froze them for a short while, and dipped in dark chocolate mixed with a little bit of shortening. And then some sprinkles. I would have used red, white and blue... but I didn't have any. I did have these nice red and green non-pareils though, so expect a re-run of these at christmas! And oh - they were great. Although I don't think I need to tell you that. 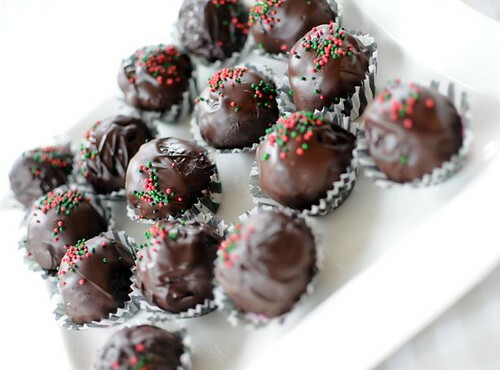 I've never tried to make cake balls despite seeing many recipes. I love mint, though, so this is proabbly the recipe tat will make me try it for myself. Bookmarked! These really sound great. Mint and chocolate compliment each other so well.